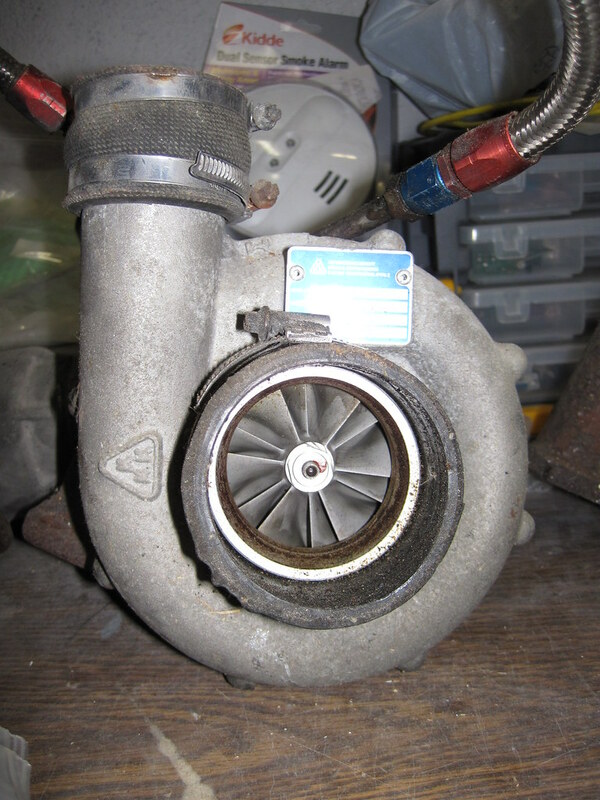 Ok, so I picked this turbo up many years ago from Andial. At the time they told me it was some kind of hybrid K27. I had thought all these years it was a K27-7006 but after recently pulling it out of my parts box I realize the tag is not for a 7006. Anyone know what this thing is? Ok, so I took some additional pictures of it next to my K27-3DLZ doorstop, dorstop is on the right. No idea....looks like a big hummer...hope you got a good deal on it 'cause it may not work for a 930. Bolt her up and go for a spin, see how you like it. 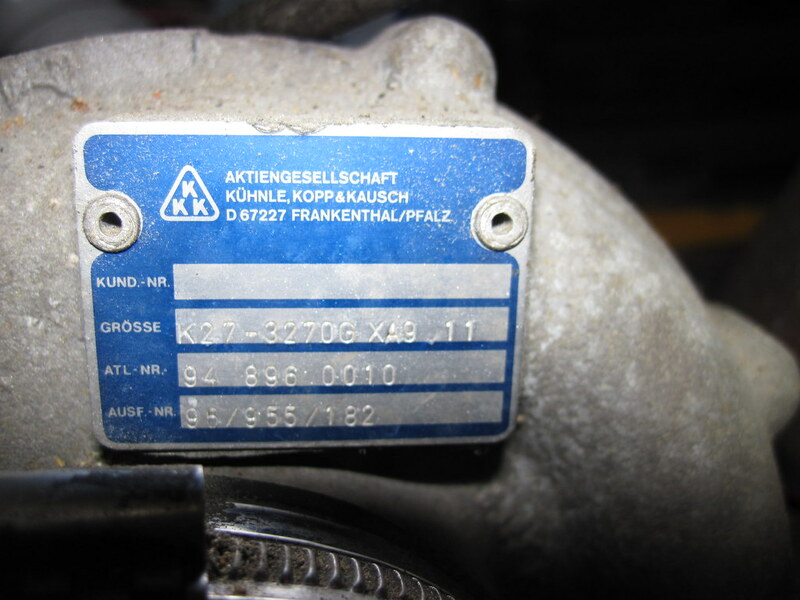 K27's for a 930 are usually the 7200 or 7006 versions. There are so many other K27's out there for other applications/cars. 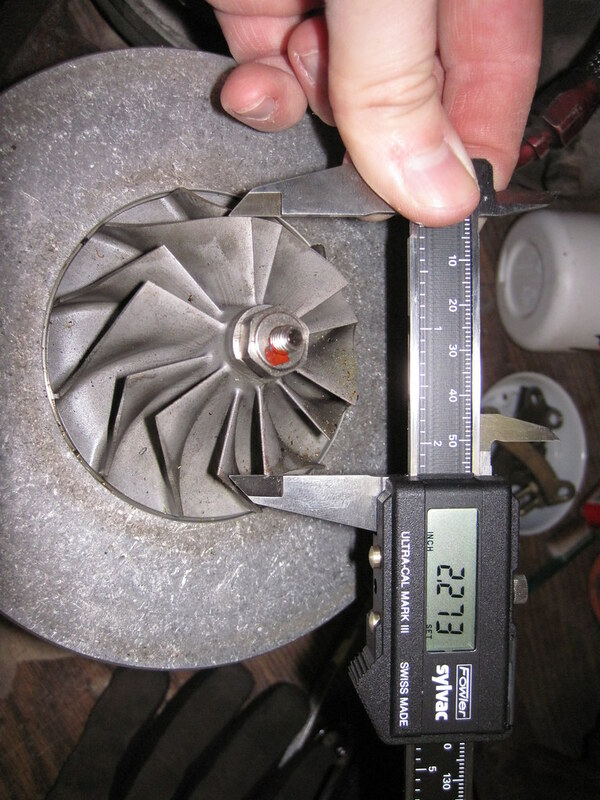 This turbo was on my 930 for several years and worked very well. I purchased it from Andial back in the early 90's and was told it was some sort of hybrid designed specifically for the 930. It was night and day from the 3DLZ. My big concern now is if it will work well with all the modifications I have made. Target HP is between 500-550. It looks alot like a K27 7006 turbine/hot side from the size and positioning or offset of the exducer of the turbine wheel in the housing. 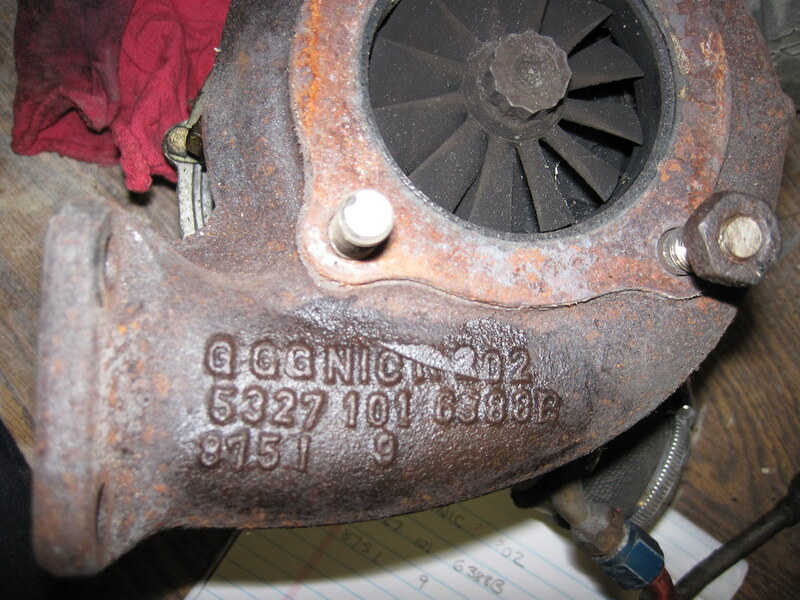 I can't read the numbers on the turbine housing. The compressor side is a guess. It would help to hold a tape measure across the intake opening. You should take the compressor housing off the backplate and clean all the dirt out with brake clean, rags, and q-tips on the compressor baldes. Take the 10mm bolts out and lift it straight off without hitting the compressor wheel. Then you can measure the inducer, exducer, and depth of the wheel and there are websites with the dimensions of all the different 3k compressor wheels. There is a big silicone o-ring in a groove on the backplate. Don't pinch it when putting it back together. Andial was no help at all. Can't say I blam them as it was years ago that it was purchased. I tried to read the numbers on the hot side in another pic I have but cant make them out. I will get them tonight and re-post. As for the cleaning, Will brake clean hurt any of the seals in there? I will take it apart tonight and take some measurements as well if I have time (and the garage warms up). I will also look through my old records for the car and see if I can find the invoice for this thing. Maybe some clues on that. Bottom line is based on available web information this looks like THE largest factory K27 compressor (for the timeframe). Thats good. the 11 is convention for turbine area in cm2 and 11 is typical of 930 turbo configurations. It probably is the same as, or very similar to a -7006. 500-550HP? Your best bet is a modern turbo with larger compressor and high efficiency turbine stage, plus serious intercooling. On this engine it will be easier to accomplish if you resist the urge to increase fixed compression over 7.5:1. As a trend, budget turners will make more HP for less by keeping the C.R. low, stock 7:1 is best. Increased C.R. may be desirable for off boost response but it demands costly hardware when the goal is serious high HP. Last edited by copbait73; 01-12-2010 at 07:36 AM..
Great info copbait73. As for my build, it is a 3.0 Turbo with a big bore P&C set purchased from our host. Displacement was increased to 3.2 and compression was increased to 7:1. I have the Euro exhaust and plan on running a zork or Rarley8 muffler. It has GT2 EVO Twin Turbo Cams and EFI (Motec M600) using the Carrera intake and twin plugged Coil-Near-Plug ignition. I also have an Andial IC but have not decided if I am going to just build a full bay IC. 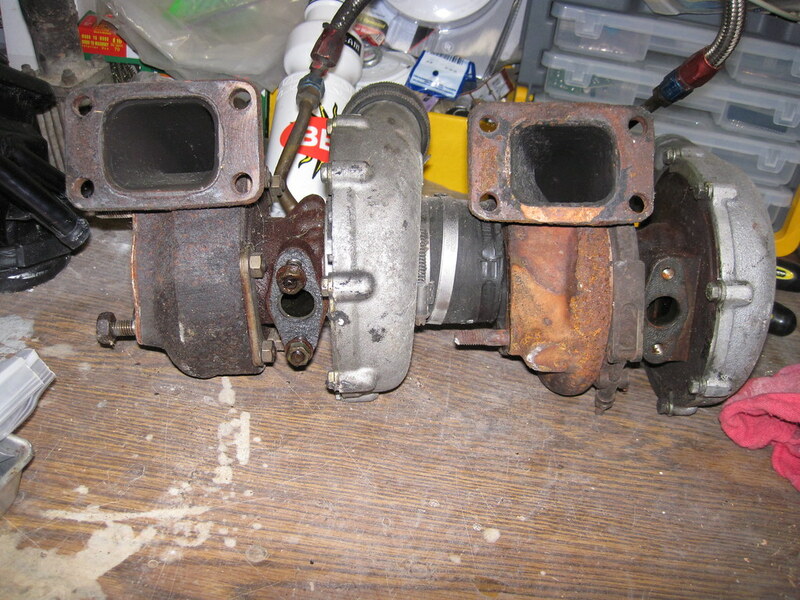 I would like to use this turbo to get the car going as I have everything to put the engine back together. I also have a set of K16 on the shelf but would need to do major fab work to get them on the car. Brake clean won't hurt the turbo components. Everything in there is metal, except for the o'rings which are made of a material resistant to oil and petroleum distillates. I've had similar "luck" with contacting Andial to verify numbers on cams. I don't think they're too polished at number keeping. I think my best bet is dissecting it. I have to clean it anyway so i will take plenty of pics and measure everything up. Anyone have a link to what I should be measuring? I hate to miss anything while I have it apart. Does anyone have a machine to map it? Maybe Durabuilt? I mentioned brake clean to clean it because it won't swell or damage the red silicone o-ring that goes around the perimeter of the backplate in a groove or any other parts and it evaporates fast. You probably have an air compressor so brake clean, a small brush, q-tips for the compressor wheel, and compressed air is enough to clean it up. Just blow the dust and dirt out of the hot side, the engine will blow the rest of the loose old exhaust carbon out once you drive it. With the large backplate o-ring removed you can use mineral spirits. The rest of the thing including the 2 piston ring oil seals is made of different metals and solvents won't hurt it. Oil the bearings real good before spinning it up with compressed air. My guess is you have a K27 7006 there but you said they said it's a hybrid and I don't know what a K28 or K29 compressor wheel looks like so as far as I know it could be using a compressor wheel from one of those. Visually it's not a Holset - Cummins compressor wheel from a more recent style of K27 hybrid. Ok, I disected it tonight. I did not have time to clean it so don't mind the dirt and oil. I also took measurments of the compressor side. 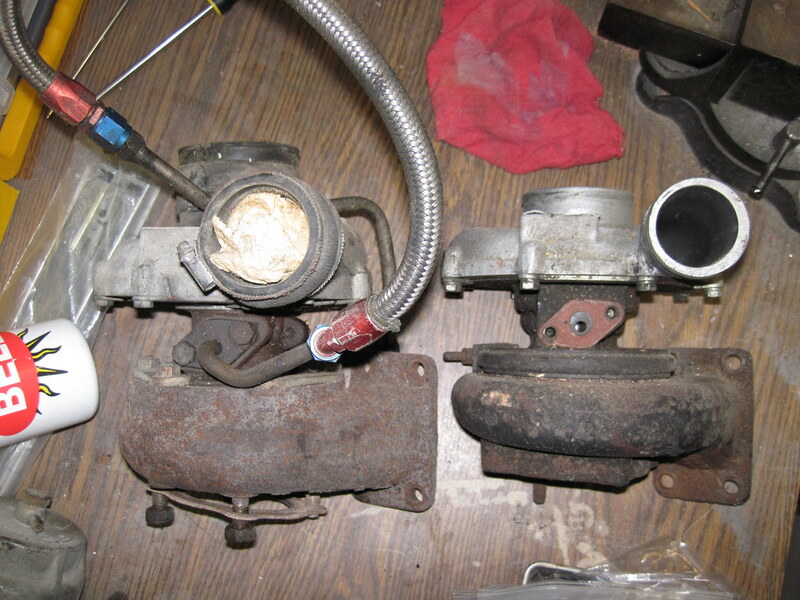 I did some research tonight and found a PDF that had parts for many K27 turbo's. Unfortunately it did not list mine. It also gave dimensions of compressor wheels and mine did not match any of them. Any suggestions on sites with data to compare to my measurements? You have a K27-7006 "base" turbocharger with a K29 compressor wheel machined into the 7006 compressor housing. FYI: there was only one "larger" K29(family) compressor wheel used in higher output applications. RUF and a few other German Tuners used this "rare" wheel. 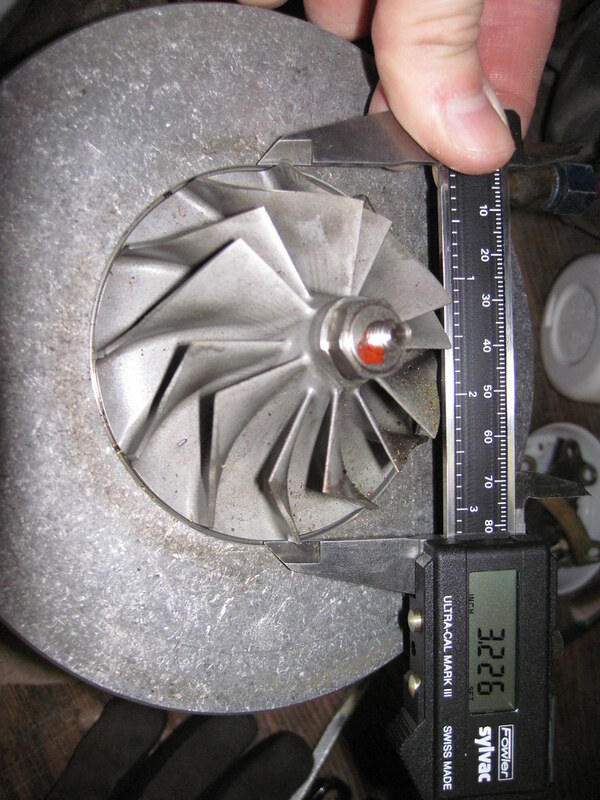 By any chance do you have any links that reference this turbo or K29 wheel? I am really trying to understand what application this would work best with. I would think that with that wheel it would fit my target horsepower though. I understand its old technology but I have everything to bolt this thing up and get my car back on the road. I could always change it out later. 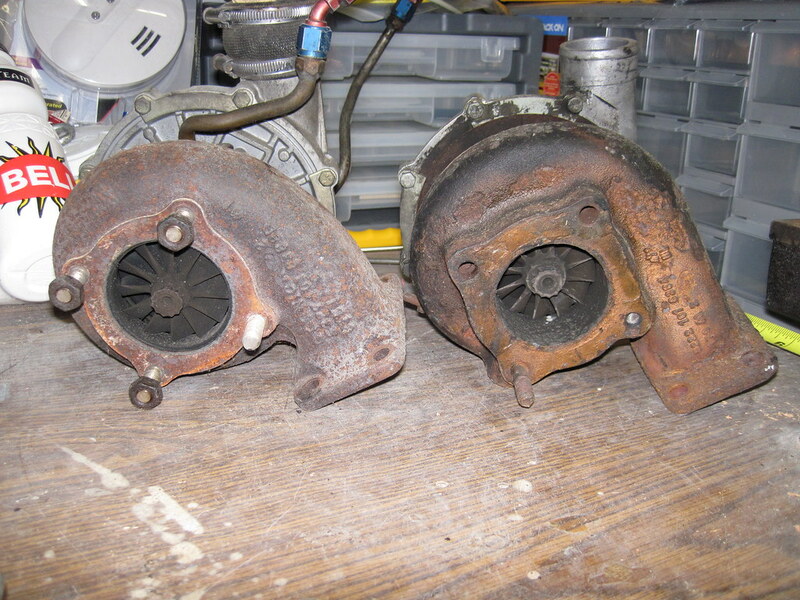 Bill you won't find any published KKK data for that turbocharger because it is a "hybrid" design. 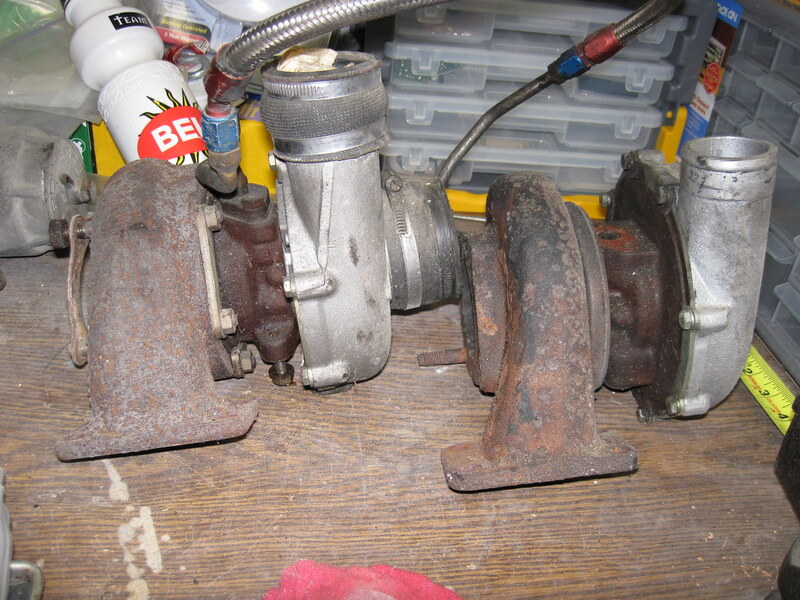 I have built them years ago..
You already have the turbocharger and it doesn't look like it's leaking. I would clean the fine sand/dirt that is around the compressor wheel and backplate>>and run it. If you have a target HP number that you have to "make" you will have to crank the boost to get there..
Run the engine on the dyno and log your boost against your torque curve. You will see when the K29 compressor wheel starts to taper off. The RUF design used the VERY large K29 compressor housing. It dwarfs the 7006 K27 compressor housing. I think I will do as suggested and just use it and see what it does. I know a Turbo upgrade is in my future but I would like to just use what I have at this point to get me going again.